George Stephenson, inventor and founder of railways, was born at Wylam, Northum­berland, on June 9, 1781. His early life was spent in extreme poverty. To earn money he began repairing watches and clocks. In 1815, he designed and produced his version of the miners’ safety lamp. About that time he was busy producing for the colliery a “travelling engine” from pit­head to the port. It was a success and he persuaded his directors to use steam instead of animal traction. The railway was opened on September 27, 1825, and the first public passenger train in the world was drawn by Stephenson’s “Active”, later renamed “Lo­comotive”. When the Liverpool and Manches­ter railway was built, Stephenson again per­suaded the directors to try locomotives. A prize was offered for the best locomotive — Stephenson’s “Rocket” won it. George was one of six children. The Stephen­sons lived in one room and were too poor to pay for their children to go to school. There was no free education at the end of the 18lh century, and even if there had been, Stephenson’s parents could not afford to send their children to school instead of work. Not until he was a man George Stephenson learned to read and write. He was a good and clever child; every day and midday he took his father’s dinner to the mine. When George was eight years old he got his first job. A widow paid him two pence a day for watching her cows. George was proud to be earning money, and each day he would hand over his small wage to his father to help him. When he was a little older he told his fa­ther that he would like to have a job at the colliery. So his father found him a job as a “picker”. He had to pick coal from stones that had been mixed with the coal during excavation. They had nothing to do with engines. The little boy was always fascinat­ed by anything mechanical, and when he was 14 he found himself work in a mine, assisting an old man with his pumping en­gine. He was happy — at last he was able to spend all his spare time studying the work­ing of the engine. His ambition was to know more about the working of steam engines. So he set to work to educate himself. He went to a small night school where he was taught to write and do simple arithmetic. On his 18th birthday he was able to write his own name for the first time. George spent so much time at his lessons that he even trained a dog to bring him his dinner in a can suspended round its neck so that, he did not have to waste time. One week George worked by day and the next week by night. On the night shifts he had so little to do that he mended the min­ers’ boots and shoes and so was able to buy books. He became an expert cobbler. Stephenson’s reputation as a mechanic was beginning to spread. He was asked by a firm of cotton spinners to come as their mill en­gine was giving trouble. He soon found that the trouble with the mill engine was a lot of sand that was drawn into the pumps with the water. The sand also got into the mechanism of the engine. Thanks to Stephen­son’s improvements the water from the well could reach the pump only by flowing over the rim of, a box, while the heavier sand sank to the bottom outside the box. This period, when machinery was beginning to take the place of human labour, is known as the Industrial Revolution. The factories needed coal for driving their machines, and therefore the demand for coal was becom­ing greater. For many years people were wondering whether steam engines might not be used to move vehicles. Several attempts had already be made to design a steam locomotive — a moving engine, based upon James Watt’s engines. James Watt, the inventor of the modern steam engine, was born at Greenock, Scot­land, on January 19, 1736. James was not at all strong. He suffered from terrible head­aches and sometimes he had to take his bed for several days until the attack passed. He had an excellent memory and a natural love of work. James was not talkative. He went to London at the age of 19 to learn to make mathematical instruments. After a year he returned to Glasgow and was able to open a shop on the grounds of the Uni­versity. One day he was asked to repair an engine worked by steam, which was used for pump­ing water out of mines. Watt took the en­gine to pieces, found what was wrong and soon repaired it. He decided now to make a better engine. He worked day and night for four years; finally his steam engine was finished. It was soon drawing up water from the mines at a lower level than had ever been reached before. In October 1781, Watt produced a still better engine, which was used all over the world. But there was one thing that Watt’s engine could not do: pro­pel itself and so drive a train. It was left to Stephenson to build the first successful steam locomotive. A successful locomotive had been built ear­lier by Richard Trevithick*, who in 1800 constructed a four-wheeled steam carriage that could travel on a good road. *Trevithick, Richard (1771-1833) — English engineer and in­ventor. Most of the roads in those days were very bad and could soon be ground to pieces by the heavy iron wheels of the steam carriage. It is why no use was ever made of Trevithick’s invention. Stephenson followed these earlier experiments with great interest. At Tillingworth Mine the coal had to be car­ried to a point eight miles away to be shipped by water. This was done by means of what was called a tramway — a set of wooden rails covered with iron, along which ran cars pulled by horses. The owner of the colliery near George Stephenson’s birthplace bought some of Trevithick’s engines and began to experi­ment for himself. Stephenson went to watch the locomotives being tried out. Soon he was sure he could build a far better engine than any yet seen. He persuaded the owners of the mine to let him build what he called a “travelling engine” to do the work of the horses. Such was Stephenson’s reputation that the owner of the mine lent him money and tools for his experiments. Stephenson’s engine took about ten months to be built, and it was finished on 25th July, 1814. It was the first successful railroad engine to haul cars and coal. Unfortunate­ly, it cost as much as horse power and was just as slow. Within a year Stephenson had made im­provements to his locomotive. At that time he was hard at work on anoth­er difficult problem — how to construct a lamp which miners could safely use in the pits. Coal gas had caused many terrible ex­plosions in the mines. These explosions took place when miners took lanterns into the parts of the mines where gas had collected. Electric lighting had not yet been invented. A miner must have a light of some kind to guide him. He cannot work in the dark. What he needed was a safety lamp. One day Stephenson was asked to help when an underground gallery caught fire. He called the volunteers to accompany him down to the burning gallery and to help their comrades. They succeeded to rescuing the miners. So Stephenson set to work to in­vent a safety lamp. He discovered that if the lamp flame was protected by a metal plate with small holes in it, it would not explode and yet would burn steadily. Stephenson’s lamp was a great success. Stephenson again turned his attention to the locomotive. A rich landowner was in­tending to build a railway of about 36 miles to carry both goods and passengers between Stockton and Darlington*. *Stockton-on-Tees—town, port and administrative headquar­ters of Stockton-on-Tees metropolitan borough on the Riv­er Tees, 5 kilometres west of Middlesborough, northeast England. Darlington— unitary authority in County Dur­ham. northeast England. Stephenson got the task of building the railway with metal instead of wooden rails and to use steam engines instead of horses. It seemed to peo­ple a mad experiment. Stephenson was work­ing from dawn to dusk every day. When the new Stockton-to-Darlington rail­way was opened on September 27, 1825, sev­eral thousand people came to watch the cere­mony. The train consisted of six wagons loaded with coal and flour and 22 trucks fitted with benches for the use of any members of the public who were willing to risk their lives by taking part in the journey. Stephenson him­self drove the engine. Ahead of it galloped a man on horseback waving a red flag to warn people to train was coming. In a few months a regular passenger service had been opened between Stockton and Darlington. In spite of the success of Stephenson’s loco­motive, horses were still used for some time for both goods and passenger transport. Stephenson was soon invited to build a still larger railway, this time between Liverpool and Manchester. The idea was magnificent. The Liverpool-Manchester line was opened on September 15, 1830, and was such a success that people all over the world began to build railroads. Stephenson became a very rich man. But he never forgot his humble origin and was al­ways ready to help workmen. Remembering how much he had suffered through his own poverty and lack of education he helped them to give their children an elementary education. 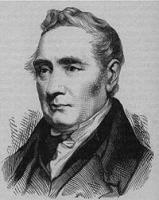 George Stephenson died on August 18, 1848. His only son, Robert*, survived his father by 11 years. *Stephenson, Robert (1803-1859) — an English engineer, the son of George Stephenson. He continued his father's work on the development of the steam-powered train, but is best- remembered as a builder of bridges. Upon Robert’s death a monu­ment to father and son was erected in West­minster Abbey. But their best memorial is to be seen in the giant expresses today, which have reduced to hours journeys that in the old days of horse travel took days and nights.